There are multiple ways to solve a problem using a computer program. For instance, there are several ways to sort items in an array. You can use merge sort, bubble sort, insertion sort, etc. All these algorithms have their own pros and cons. An algorithm can be thought of a procedure or formula to solve a particular problem. The question is, which algorithm to use to solve a specific problem when there exist multiple solutions to the problem? Algorithm analysis refers to the analysis of the complexity of different algorithms and finding the most efficient algorithm to solve the problem at hand. Big-O Notation is a statistical measure, used to describe the complexity of the algorithm. In this article, we will briefly review algorithm analysis and Big-O notation. We will see how Big-O notation can be used to find algorithm complexity with the help of different Python functions. Why is Algorithm Analysis Important? To understand why algorithm analysis is important, we will take help of a simple example. Suppose a manager gives a task to two of his employees to design an algorithm in Python that calculates the factorial of a number entered by the user. Notice that the algorithm simply takes an integer as an argument. Inside the fact function a variable named product is initialized to 1. A loop executes from 1 to N and during each iteration, the value in the product is multiplied by the number being iterated by the loop and the result is stored in the product variable again. After the loop executes, the product variable will contain the factorial. The manager has to decide which algorithm to use. To do so, he has to find the complexity of the algorithm. One way to do so is by finding the time required to execute the algorithms. The output says that the algorithm takes 9 microseconds (plus/minus 45 nanoseconds) per loop. The second algorithm involving recursion takes 15 microseconds (plus/minus 427 nanoseconds). The execution time shows that the first algorithm is faster compared to the second algorithm involving recursion. This example shows the importance of algorithm analysis. In the case of large inputs, the performance difference can become more significant. However, execution time is not a good metric to measure the complexity of an algorithm since it depends upon the hardware. A more objective complexity analysis metrics for the algorithms is needed. This is where Big O notation comes to play. Big-O notation is a metrics used to find algorithm complexity. Basically, Big-O notation signifies the relationship between the input to the algorithm and the steps required to execute the algorithm. It is denoted by a big "O" followed by opening and closing parenthesis. Inside the parenthesis, the relationship between the input and the steps taken by the algorithm is presented using "n". To get an idea of how Big-O notation in is calculated, let's take a look at some examples of constant, linear, and quadratic complexity. The complexity of an algorithm is said to be constant if the steps required to complete the execution of an algorithm remain constant, irrespective of the number of inputs. The constant complexity is denoted by O(c) where c can be any constant number. Let's write a simple algorithm in Python that finds the square of the first item in the list and then prints it on the screen. In the above script, irrespective of the input size, or the number of items in the input list items, the algorithm performs only 2 steps: Finding the square of the first element and printing the result on the screen. Hence, the complexity remains constant. 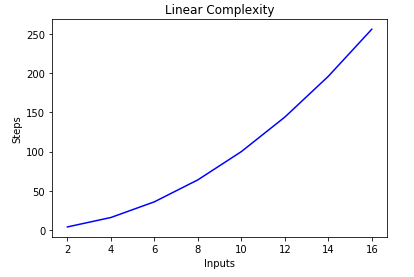 The complexity of an algorithm is said to be linear if the steps required to complete the execution of an algorithm increase or decrease linearly with the number of inputs. Linear complexity is denoted by O(n). 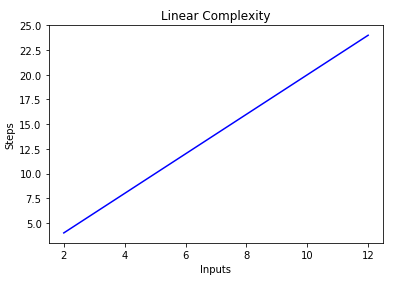 The complexity of the linear_algo function is linear in the above example since the number of iterations of the for-loop will be equal to the size of the input items array. For instance, if there are 4 items in the items list, the for-loop will be executed 4 times, and so on. In the script above, there are two for-loops that iterate over the input items list. Therefore the complexity of the algorithm becomes O(2n), however in case of infinite items in the input list, the twice of infinity is still equal to infinity, therefore we can ignore the constant 2 (since it is ultimately insignificant) and the complexity of the algorithm remains O(n). In the script above, you can see that we have an outer loop that iterates through all the items in the input list and then a nested inner loop, which again iterates through all the items in the input list. The total number of steps performed is n * n, where n is the number of items in the input array. 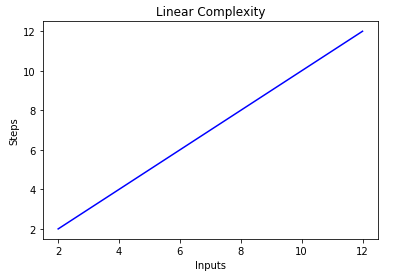 The following graph plots the number of inputs vs the steps for an algorithm with quadratic complexity. In the previous examples, we saw that only one function was being performed on the input. What if multiple functions are being performed on the input? Take a look at the following example. In the script above several tasks are being performed, first, a string is printed 5 times on the console using the print statement. Next, we print the input list twice on the screen and finally, another string is being printed three times on the console. To find the complexity of such an algorithm, we need to break down the algorithm code into parts and try to find the complexity of the individual pieces. The complexity of this part is O(5). Since five constant steps are being performed in this piece of code irrespective of the input. We know the complexity of above piece of code is O(n). We said earlier that when the input (which has length n in this case) becomes extremely large, the constants become insignificant i.e. twice or half of the infinity still remains infinity. Therefore, we can ignore the constants. The final complexity of the algorithm will be O(n). In the script above, we have a function that takes a number and a list of numbers as input. It returns true if the passed number is found in the list of numbers, otherwise it returns false. If you search 2 in the list, it will be found in the first comparison. This is the best case complexity of the algorithm that the searched item is found in the first searched index. The best case complexity, in this case, is O(1). On the other hand, if you search 10, it will be found at the last searched index. The algorithm will have to search through all the items in the list, hence the worst case complexity becomes O(n). 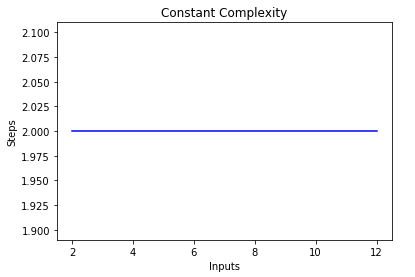 In addition to best and worst case complexity, you can also calculate the average complexity of an algorithm, which tells you "given a random input, what is the expected time complexity of the algorithm"? In addition to the time complexity, where you count the number of steps required to complete the execution of an algorithm, you can also find space complexity which refers to the number of spaces you need to allocate in the memory space during the execution of a program. In the script above, the function accepts a list of integers and returns a list with the corresponding squares of integers. The algorithm has to allocate memory for the same number of items as in the input list. Therefore, the space complexity of the algorithm becomes O(n). The Big-O notation is the standard metric used to measure the complexity of an algorithm. In this article, we studied what Big-O notation is and how it can be used to measure the complexity of a variety of algorithms. We also studied different types of Big-O functions with the help of different Python examples. Finally, we briefly reviewed the worst and best case complexity along with the space complexity.